Paul F Renda give an overview that, What and how new long distance and short distance Dead drop techniques are used by National Security Agency for secure communications. What is a dead drop? It is methods that spies use or have used to communicate with associates who have information for them. The dead drop allows them to exchange information without having actual physical contact with each other. The person leaving the information can leave it under a rock or a can or bush. A special type of empty spikes that can be dropped into holes has also been used drop information. The person leaving the information also leaves some kind of signal the drop was made. The signal could be a chalk marks on a tree or pavement. Someone views the signal and retrieves information. 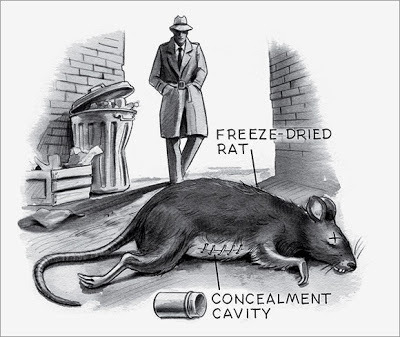 Some more unusual dead drops have used dead animals like rabbits, rats and large birds to hide the information. These have been used by both the CIA and KGB. The one problem with this type of dead drop is that other scavengers tend to mess with dead animals. The CIA and KGB found an easy solution to that; they poured liberal doses of hot sauce on the dead animals and scavenges became disinterested in them. Another type of unusual dead drop location is using a portable toilet, or Porta Potty. The commodes could hold a lot of information; however, Porter Potties are regularly vacuumed out so one would need to be careful about leaving information there. On one time that a Porta Potty was used, the information bag got stuck in the vacuum hose. More high tech drops have involved dropping a USB device in the woods, on a restaurant floor, underneath a table, or in a hole or crevice in a wall. A USB can contain gigabyte of data. One problem with dead drops is the face that the sending and receiving parties both have to be in the same geographic area. Another dead drop technique that the FBI didn't come up with but they found out about was using Wi-Fi peer-to-peer networking. You go to any cyber café, type on your laptop and instead of using the café Wi-Fi you use peer-to-peer networking. The person receiving the information only has to be in a car passing by the café. How does this new high-tech long-distance/short-distance dead drop work? How can you send information to someone in the next cube or 12,000 miles away and have no physical contact or physical presence? First you obtained an e-mail account, Yahoo or Gail or any other e-mail provider that you don't have to pay for. Then use a random character generator to create an id five to eight characters long. Since the id is randomly generated it's much more likely that it will match another account. Don't use the e-mail account to send or transmit any information; instead you use draft component of e-mail account, and leave the information there. The person receiving the information only has to know the email account id and password. They could be in the next table or across the world. They could go to any cyber café and the get information, or for greater safety they could use TOR. It is a methodology that allows you to hide your e-mail IP address and geographic location. Somebody in Queens could be sending information to Brooklyn or China, Japan or Abu Dhabi for that matter. I became aware of this technique a couple of months ago, but I have no way to check how much it is utilized. The National Security Agency (NSA) is an agency that is tasked with recording all e-mail and phone traffic coming into and out of the United States. In hot spot in the world, like the Middle East for example, the NSA intercepts traffic coming from people of interest. They also routinely monitor my e-mail and my cell phone . It is not because the federal agency has me as a person of interest; it is because I am such a fascinating character, they just want to know what I'm doing. There are many benefits of using Tor as a technique for both the sender and receiver. The sender and receiver don’t have to reside in the same geographical area, there is a very low risk of the information being lost or intercepted, the information can be encrypted or compressed, it is difficult to find the geographic area that the information came from, and it is difficult to do a pattern analysis.